If you’ve been reading any of the articles I’ve written and shared over the last several months, you might have noticed that I’ve made it a point of emphasis to illustrate the importance of how many systems in our body, not just our tissues, contribute to neuromuscular function and consequently pain and performance. The term “neuromuscular” refers specifically to how our nervous system (brain, spinal cord, and peripheral nerves and receptors) controls how our muscles contract and relax. Our muscles function based on how our brain tells them to function; muscles are slaves to the orders given to them by the brain. How our muscles function determines how our joints move individually and in larger coordinated patterns to produce movement. For the purposes of this post, I’m going to focus on what I consider to be some of the most important tenets and principles of biomechanics and functional anatomy as they relate to training and rehabilitation. There are a handful of principles that are at the forefront of what some the best coaches and therapists out there are utilizing. Three prevalent ideas that have come to really define higher-level assessment and correction strategies when it comes to training and rehabilitation are the “Joint-by-Joint Approach”, fascial slings, and kinetic chains. I’m going to break down each one and attempt to extrapolate the most useful tools that can be derived from each. When I first started out in this industry, I began as a personal trainer trying to get my hands on everything related to corrective exercise and functional training; I wanted to explore the depths to which strength and conditioning could be catered towards rehabilitation. The first foundational principle that really defined my training paradigm early was the “Joint by Joint Approach,” popularized by physical therapist Gray Cook and strength coach Michael Boyle. Some joints require more range of motion, some joints require less. Some primarily move in rotation (glenohumeral) while others might be more suited for flexion and extension (knee). If we lack mobility in a joint designed to be mobile, the next joint involved in the movement will often pick up the slack, and we may end up getting too much movement in a joint that is more suited to remain more fixed and stable. This can obviously cause problems. The joint-by-joint approach is a helpful principle for determining how one area of the body can potentially affect another. 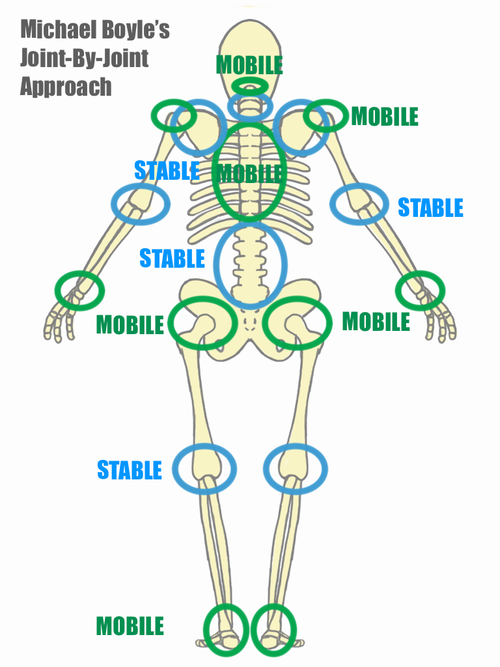 When we are utilizing the joint by joint approach in our clinical application and forming treatment and training strategies, we are largely breaking the body down into its components (joints in this case), determining which components are not working, and then provide treatment on those dysfunctional components in the hopes that with all the components working individually, we can improve how they work together synergistically. We understand the involved joints to be the ankles, knees, and hips primarily. The mobility in the ankles is limited, therefore a key component of the squat is not available. The client can now squat more deeply. By working with this model, we can often determine where our clients are breaking down in large-scale movements like a squat, provide therapy or corrective strategies to the specific area that needs it, and then recheck our large-scale movement. We are operating on the idea that a chain is only as strong as its weakest link. If we fix the weak link, the whole chain improves. Another incredibly viable and useful anatomical principle is the idea of continuities of connective tissue (fascia) spanning across areas of the body in long slings. This idea has been popularized by one of the predominant great minds in the world of fascia, Tom Myers. His book, Anatomy Trains, has had a huge influence on how movement professionals and therapists understand human movement. If we take a look at a basic fascial sling, like the “Superficial Back Line,” we can see that instead of looking at the body as an alternating series of mobile and stable joints and how they interact, we are more so looking at longer lines of fascia and how these fascial continuities form groups or longer slings of muscles that work synergistically together. The superficial back line includes (from the bottom up) the plantar fascia, achilles, calf muscles, hamstrings, sacrotuberous ligament, sacrum, spinal erectors, and neck extensors. Even though there are multiple components throughout this “line,” the idea behind these fascial slings is that if there is a problem in one part, the rest of the line will be affected via fascial tension imbalances. When we are using the fascial slings as a guide, we must appreciate not only the fascia, but also the muscles and joints included along a fascial continuity. Thinking about a long chain of muscles as a singular functional unit can be helpful in the sense of understanding how one part of the chain is directly connected functionally AND anatomically to another part of the chain. A good example of this, sticking with the “Superficial Back Line” as our functional unit, is plantar fasciitis. If you identify the involved components of the superficial back line, it includes the plantar fascia on the bottom of the foot as well as the gluteal muscles. Many times, we can make a direct connection between the glutes not contributing enough during movements involving the superficial back line (deadlifts, for example), and thus another area along the chain, in this case the plantar fascia, is getting overstimulated. Too much stimulation to any area can lead to mechanical stress over time and potentially pain. For a case like this, getting the glutes to work more efficiently can be the key to alleviating symptoms at the feet and resolving the plantar fasciitis. Using this line of thinking and appreciation of how longer chains connect seemingly unrelated structures, we can operate with more possibilities for treatment and training strategies. Another way to categorize and compartmentalize the body in order to facilitate our understanding of movement is to use kinetic chains and subsystems. Utilizing kinetic chains has become my preferred method for mapping out dysfunctions in the body over the years. Far and away the most comprehensive and useful system for understanding kinetic chains are the “5 Primary Kinetic Chains” as taught by Joseph Schwartz in his Dynamic Neuromuscular Assessment” course. While there are many ways to organize the body biomechanically, the 5 primary kinetic chains are broken down in a way that is more specific to how humans are biologically designed to move. Not only is each chain important to consider in and of itself, but understanding how each chain interacts with and supports the others is an important underlying concept. The 5 primary kinetic chains are building blocks for assessing and restoring functional movement. Looking at kinetic chains is usually more helpful than simply considering how joints interact, or by how muscles are strung together via fascial lines. Understanding kinetic chains allows us to build a functional foundation from the inside out, taking into consideration all pieces of the chain; muscles, ligaments, joints, and fascia included. Deep Longitudinal kinetic chain – Includes the lower leg muscles, hamstrings, sacrum, and spinal erectors. The purpose of this chain is to allow us to dissipate ground reaction force and absorb shock. It begins to create axial stability to allow for the large more powerful muscles to produce force. Lateral Kinetic Chain – Includes lower leg muscles, adductors, abductors, and the QLs, and has the primary role of setting a foundation for our spiral kinetic chains to operate on. Stability of the pelvis and ribcage are paramount here. Posterior Spiral Kinetic Chain – Includes the toe and plantar flexor groups, ITB, glutes, SI joint, TL fascia, contralateral lats, and extensors of the shoulder and arm. The primary purpose is to store and release elastic energy through rotation. Anterior Spiral Kinetic Chain – Includes dorsiflexors, hamstrings, hip flexors, adductors, abdominals, pecs, and shoulder and elbow flexors. The primary purpose of the anterior spiral kinetic chain is to translate much of the elastic energy stored by the posterior chain. Think punching or throwing after a windup. Understanding that each of these chains builds on the previous one, that they all have a distinct function, and that these chains play a role in almost every movement, we can utilize them to help guide our training and treatment protocols. If the core isn’t functioning well, that’s where we start. If we identify a lack of ability to absorb shock, we build on that. Then we assess how stable the axial skeleton can stay during stability challenges. Then we start to focus on build strength and power in rotation. We parse out the pieces of these chains that are not able to participate or respond well to different movements, we treat those areas with any numbers of therapeutic interventions, and then we integrate the pieces back into their respective kinetic chains. Integration occurs are several levels; within each chain individually, between the chains relative to each other, and each corrective intervention should take into account the integration of various body systems. All these models for understanding functional anatomy and biomechanics are helpful, but it’s also important to understand that our experience of movement and sometimes pain is always context specific. Certain principles or models for understanding movement have a lot of carryover. But we also need to make sure our training and therapy is helping us specifically for what we are trying to improve. Biomechanics can be broken down many different ways. No matter what lens you are viewing the body through, there are a few key principles to appreciate. Firstly, we must understand how interconnected the body is, not just structurally, but also functionally. Dysfunction in one area of the body affects adjacent or other sometimes seemingly distant and unrelated areas of the body. Secondly, we should have some way to deconstruct global complex movements into its requisite parts in order to thoroughly assess the weak links. A chain is only as strong as its weakest link. Third and most important, no matter what model you use to assess and correct movement, remember while that biomechanics, anatomy, and structure are all important, that humans are more than just machines. There is a hierarchy that we must appreciate. Muscles, joints, and tissues are at the mercy of the nervous system. We are deeper and more complex than just a collection of mechanical parts. Yes, we are physical bodies, but with emotions, and thoughts, and feelings, and souls. Never forget to treat the person, not just the parts. Hopefully this was a relatively helpful breakdown of some popular biomechanical models for understanding movement. These concepts can be applied many different ways. In the coming weeks, I will be taking these broader concepts and applying them to specific musculoskeletal issues. I’m sure some of you are antsy to finally get some specific breakdowns and have me dive into the meat and potatoes of the physical stuff. Let me know if there are any specific things you want me to breakdown!